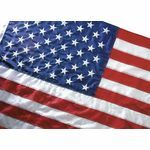 American flags made from recycled plastic bottles! Eco-Glo yarn is created from 100% post consumer recycled material (water & soda bottles). The yarn is woven and dyed red, white and blue and then sewn into American flags. This fabric has the feel and look of a 200 denier nylon. These Eco-friendly flags show pride in our country and your commitment to the planet. 100% Made in U.S.A.